A meaningful subject line is an important prerequisite of any E-Mail. The recipient most likely has many E-Mails in his Inbox. He or she is going to scan the Subject line quickly to narrow down the list of E-Mails on which to take action or read. 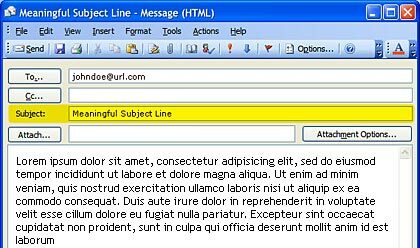 If you do not have a meaningful Subject line, the recipient may not read it or worse, may even trash it without reading. Take a moment to see whether the Subject line conveys the essence of what is in the actual E-Mail body before hitting that "Send" button.